Having already posted a Vada curry, you must be wondering why I am posting Vada Curry again. Well it so happened that just after I posted my version, Amma made another version for lunch. She paired it with Tomato Puloa which was a new combo for us. It was a total hit. I was really so happy having found another combo for making with Tomato Pulao. I always only make Cauliflower Gravy with this rice, which always is a problem when cauliflower is not in season. Now with gravy, I don’t have to worry again. Best part was my kids loved this gravy. My version tends to be little tedious to parse out the spices and other stuff for the kids, while this version is easy to manage. Kids are having a gala time with my brother’s kids being at home. It’s non stop kondatam if you know what I mean. My lil nephew who is going to be 2 in a month’s time, is so adorable. The way he comes and hugs you when he has to say sorry, makes you want to make him do it again and again. With tiny toes, he comes running and raises he hand to beat you, then when his mom says, it’s wrong to do, he immediately comes to hug you and says ssorry. With a 100 watt smile that never but charm you completely. Coming back to the recipe, I will surely recommend you trying both these together. Make Masala Vada and keep it aside. Fry all the above in oil, then add half of a whole coconut medium size. Fry for 2 mins. Tomatoes – 2 medium, fry tomato separately and then add to the above. Once it is cool, grind to a smooth paste. Make Masala Vadas and keep it aside. For the gravy, heat a kadai with oil, fry small onions, ginger garlic paste. Cook till the onions turn colour. Then add the ground masala with salt. Bring to boil. Simmer for 5 mins. When the gravy consistency gets thicken, add the deep fried masala vadas to the gravy and simmer for 5 mins. Serve with Tomato Pulao or Parotta. 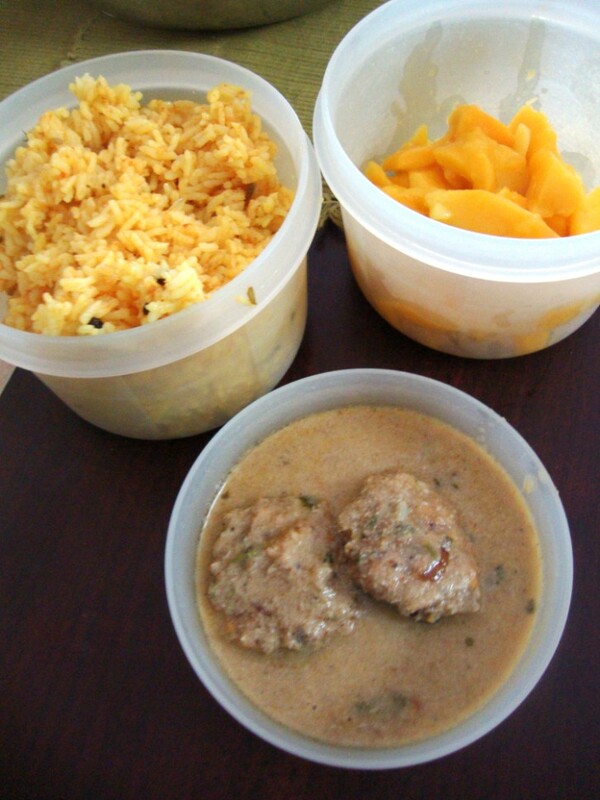 Notes: Normally the vadas are broken and added to the gravy, but we added it as such. It gave a nice crunch to the gravy. This is mostly made to use up leftover vadas. But that has never been the case at our home. 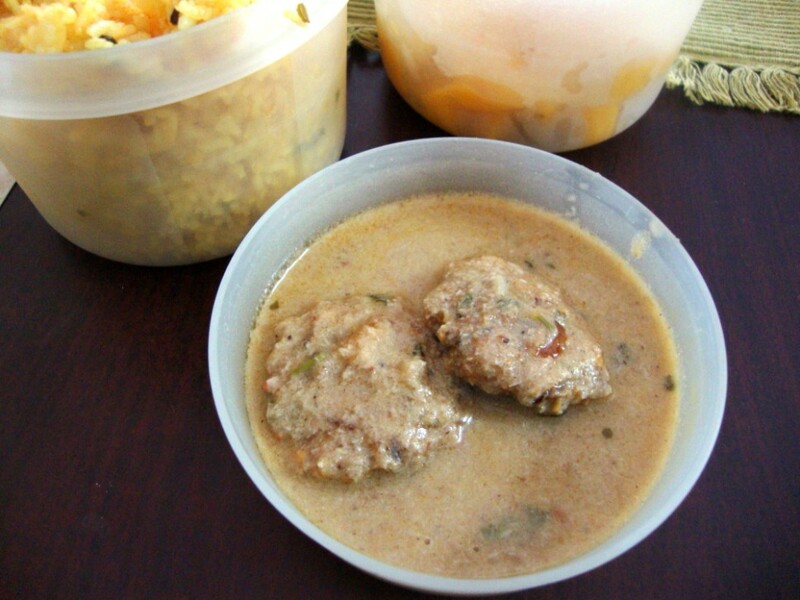 Now that I have two recipes for Vada Curry, I am sure there are many other variations. Do share if your method is different. But if you have not made this delicious gravy yet, then I suggest you get down making it right away! Wow! Im hearing about Vada curry for the first time, I must try this sometime! Thanks for posting the recipe! Drooling over your delicious looking vada curry. Delicious vada curry, well done..
Nice and delicious curry !! I tried making vada curry few weeks back n we loved it! shall post it soon ! Tis is sabina,am a ardent fan of ur cookblog.and i too wanted to share my recipes and the dishes i make day to day so created a blog and so want to know how i can take part in the ICC events and get myself part of talimpu ..Please can u help me.. Mom never used to make this. but I remember having this in my college hostel. looks delicious Valli. Fantastic dish! I gotta make this sometime.